This Saturday marks what would have been Jaime’s 29th birthday. Okay, I just freaked out and double checked my numbers because it seems crazy to think she would have been that old since she was 27 when she died. Weird. At any rate, Charlie’s brother and his wife and kids drove in from MN for the next 10 days, and we spent all day yesterday hanging out at my FIL/MIL’s house with the fam. 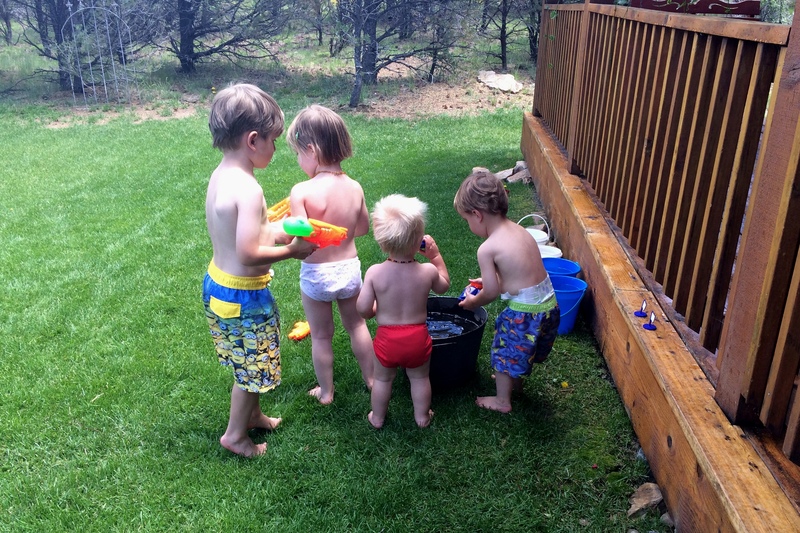 The kids has SO much fun playing together all day (filling squirt guns in the photo below after they all wussed out about running through the sprinkler – ha!). This is going to be a crazy busy week full of covering for a coworker who is on vacation and spending as much time as possible with friends and family coming into town in time to celebrate Jaime’s life at a big party at my inlaws’ house on Saturday, but it’s going to be full of love and fun, so we’re calling that a win! How long of a drive is that? I feel like I’ve asked this already before. What do they do with the kids in the car for that long? Wishing you and your family a wonderful celebration for Jamie’s 29th birthday. By the looks of it, the youngest members are already doing so. Enjoy this special family time together! ❤ cousin love is the best. I love this…what a wonderful way to keep Jaime alive in your hearts by celebrating her…. This picture makes me smile so much.